Corvus the Crow, with pointer stars toward Spica. 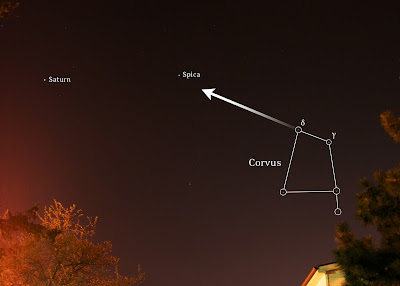 Part of the shape resembles a kind of sail called a spanker, which gives the 4-star asterism the name "Spica's Spanker." I was at the gym when the moonrise began at twilight tonight, but I saw it hovering over the intramural fields on the drive home. 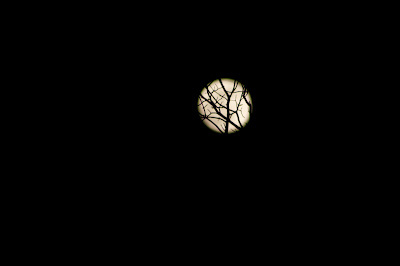 I went inside to get our dog Katie and took her outside to scout a spot to set up my tripod. 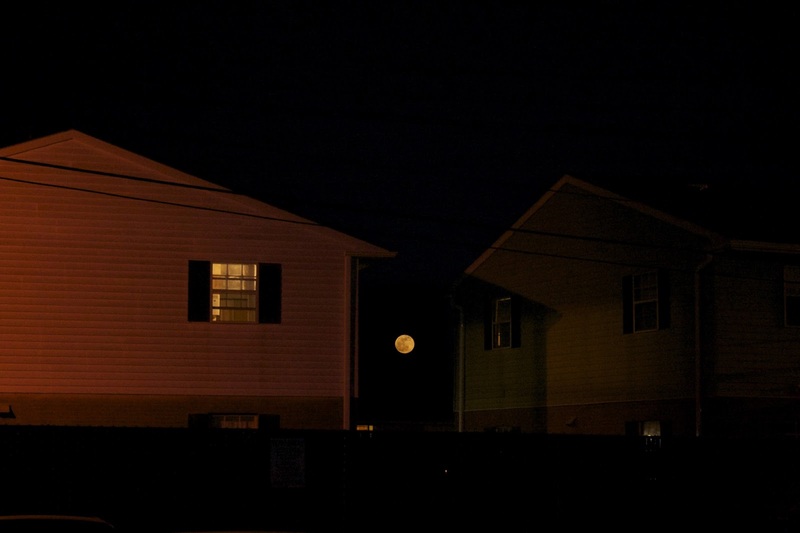 My plan was to get a picture of the moon rising over the apartments next door. While I was walking around the courtyard I saw a big yellow moon looming low between a the buildings. It was like the Stonehenge of equal opportunity housing! 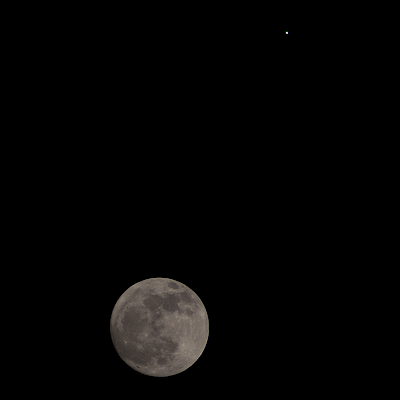 I wanted to take advantage of the clear sky, even though the moon is dominating and drowning out everything else around it tonight. 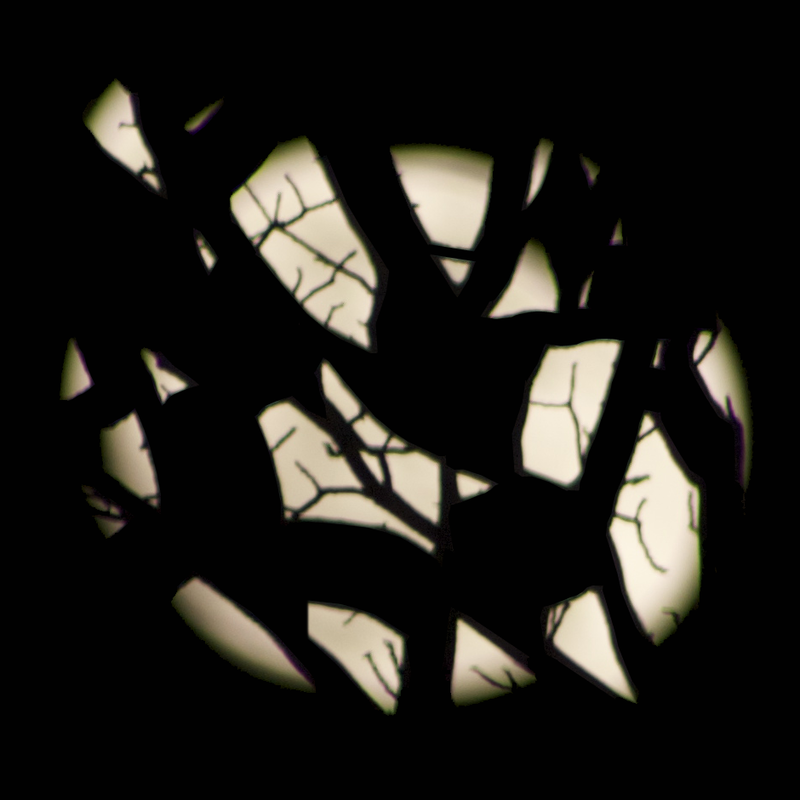 Here is one artsy/clever moon shot through a pine tree, and a stack of 100 frames trying to bring out as much detail as possible in a realistic way. 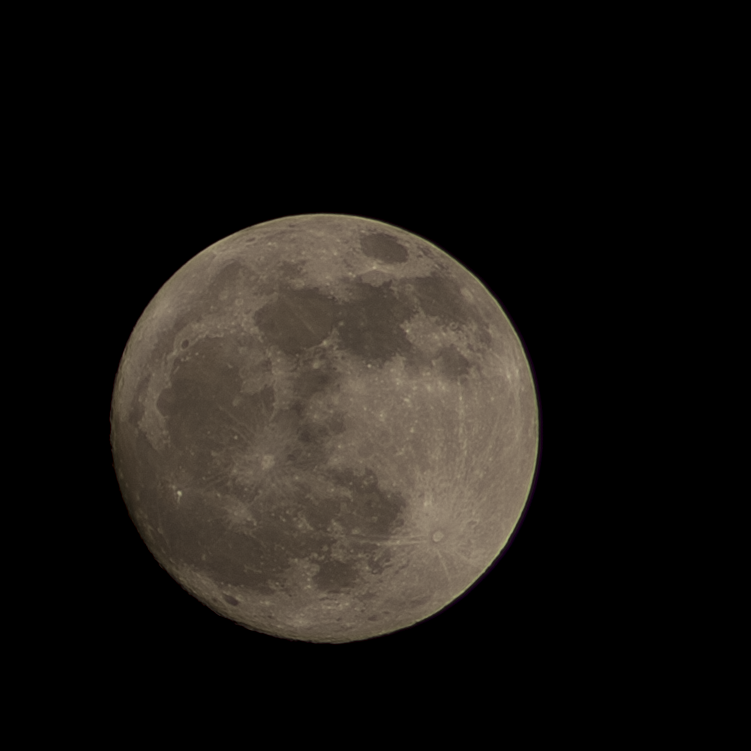 I think I'm reaching the upper limit of the resolution I can get on an 8 MP camera. 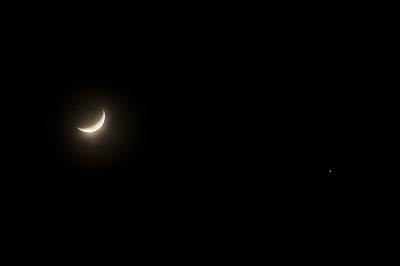 There's a faint stacking halo to the right of the moon, as if one frame got mis-aligned and spewed off to the side. So I guess it wouldn't be correct to say that this is the MOST detailed I could be at 8 megapixels, but for right now it is. I finally completed my set of moon phase photos! 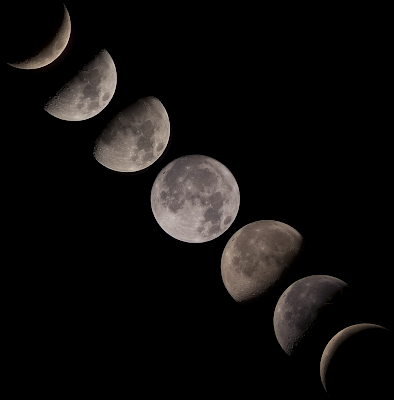 Obviously these are just the named categorical phases, because the shadow on the moon is constantly changing by tiny percentages all the time. It was a fun project to work on! Each image is a stack of at least 20 frames to clean up the noise. I took the photos between February 25, 2013 and April 14, 2013. I left the colors a little different because I used different camera settings for each one and took the images at slightly different times of night (and early, early morning). I'm really pleased with the result! 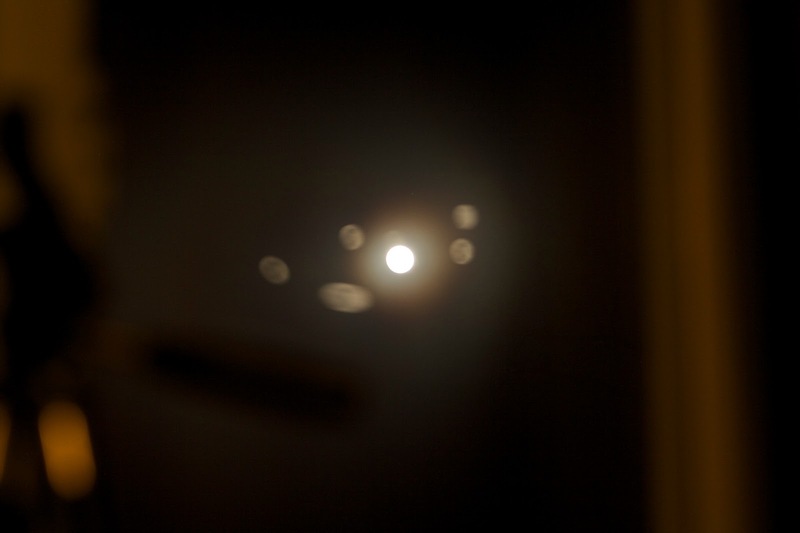 It's my own little moon collection. Previously, I realized I only had waxing phases in my collection. 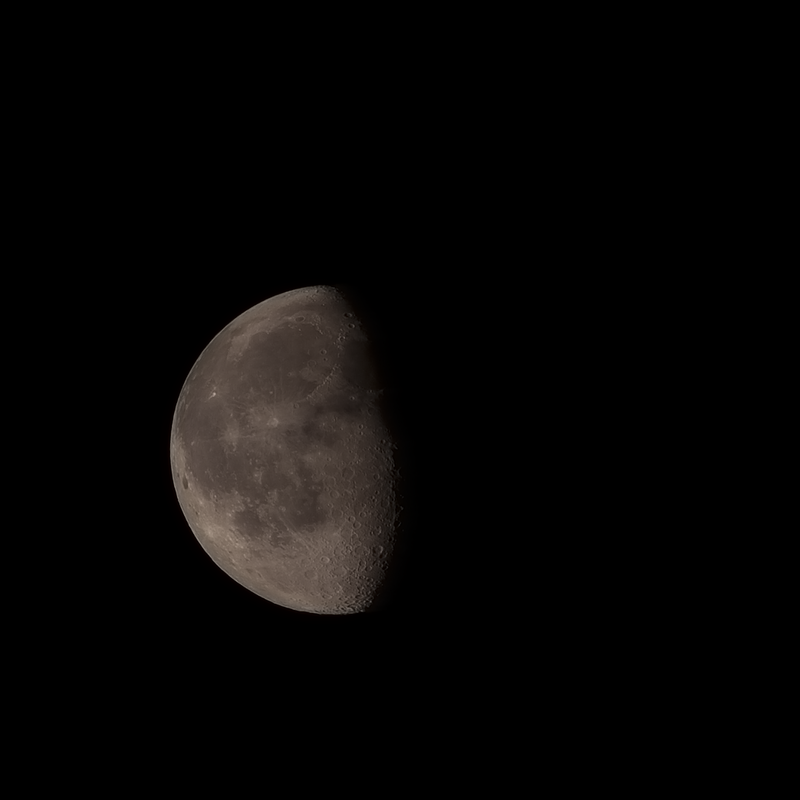 I must say, the waning phases are quite cool and different. 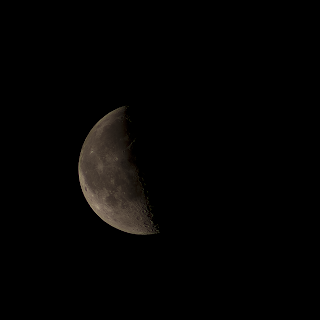 I guess the waning phases aren't as popular because you have to stay up later and later to get them, or get up right before sunrise to get a good waning crescent. Last night I woke up at 2:30am to take the dog out. 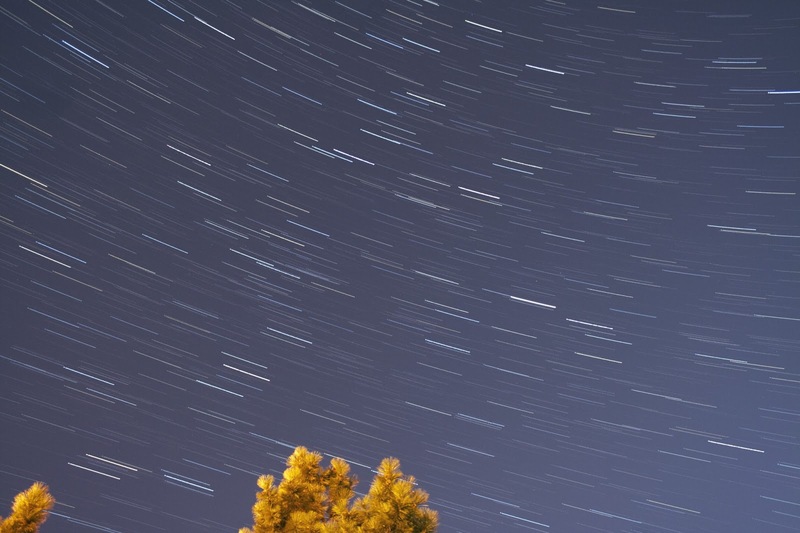 I planned ahead for the Lyrid Meteor Shower by setting my tripod and camera out before going to bed, and making sure my batteries were charged up. 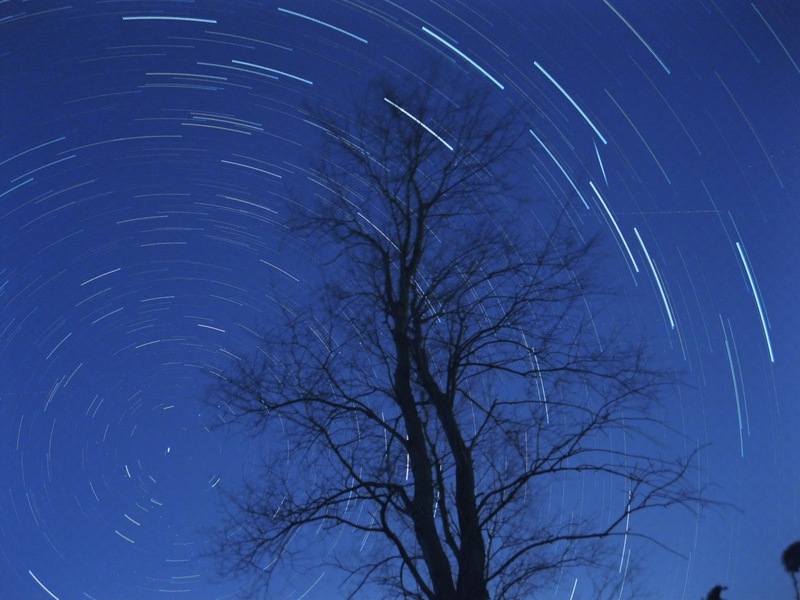 I read that the Lyrid shower isn't typically as dramatic as other meteor showers, however I figured it was worth a peek since I was up and it was clear. When I took my dog out, I did a quick scan of the darkest part of the sky and immediately saw a meteor streak from East to West (facing South). The 83% moon was still peeking over the top of the apartment building and producing a lot of sky glow. After picking up Katie's poops I went back in side, optimistic that the meteor shower would be as prolific as the Geminids this past winter. While my cameras were running, I spotted one more meteor in the general area where I thought it would make it into frame - alas, either it was just out of frame or it was too brief to show up on the sensor. 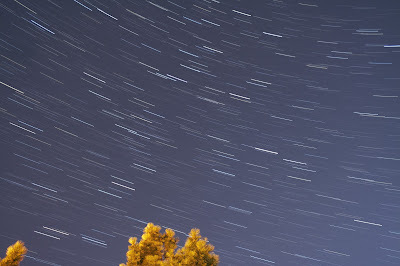 Visually, I was able to observe 2 pretty good Lyrid meteors, but I was left with nothing on "film" a.k.a. nothing in the can. While I was out, I did become more familiar with the late spring sky, which will soon become the early summer sky. 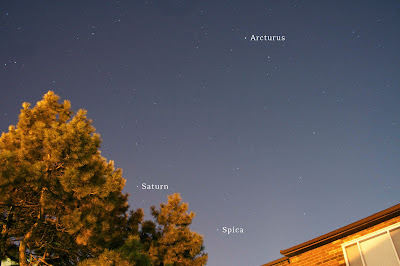 I spotted Hercules, and of course the Summer Triangle. I also took a picture of Arcturus, Spica, and Saturn in a triangle next to the glow of the moon just behind the apartments. 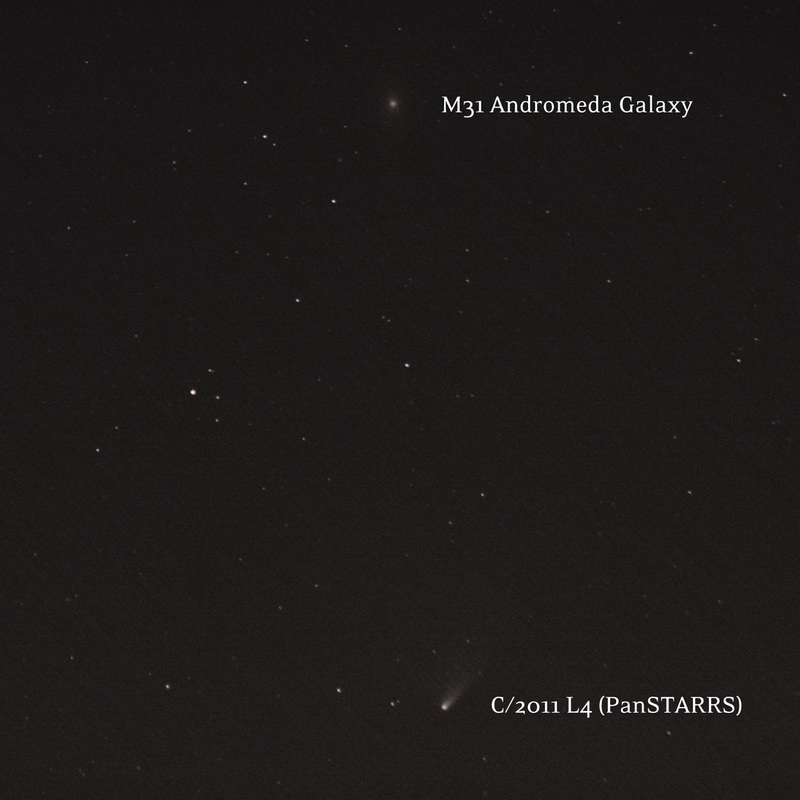 Last month I posted my plan to photograph C/2011 L4 (PanSTARRS) as it approached the Andromeda Galaxy (M31). I was successful, but never got around to blogging about it, so here goes! 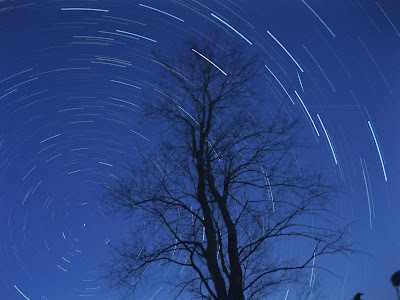 On April 2, 2013 I went to Slippery Elm Trail at dusk to wait until the comet and galaxy were visible low in the NW sky. 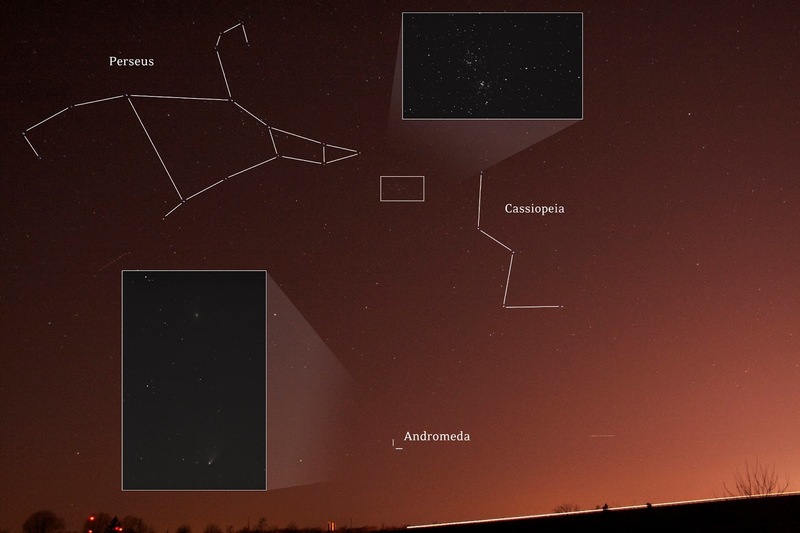 I had all but given up on Andromeda for the season, because the view to the west from my apartment is blocked below 40º or so. This far into Spring, Andromeda is well behind the building by sunset, and so low in the sky by the time it gets dark that taking detailed deep sky images with my camera probably wouldn't yield anything beyond a fuzzy blob. 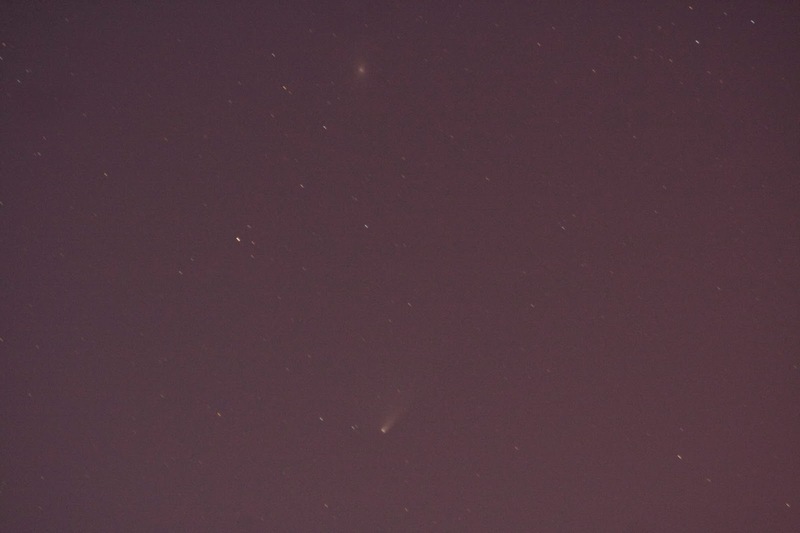 However, paired with a comet, a fuzzy blob would be a welcome target! 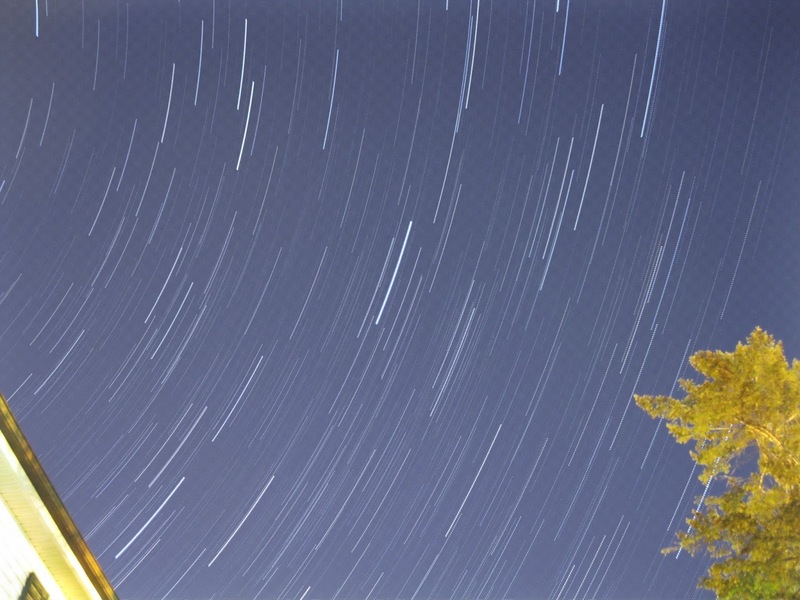 I used bright stars in Cassiopeia and Andromeda to star hop to the approximate location. 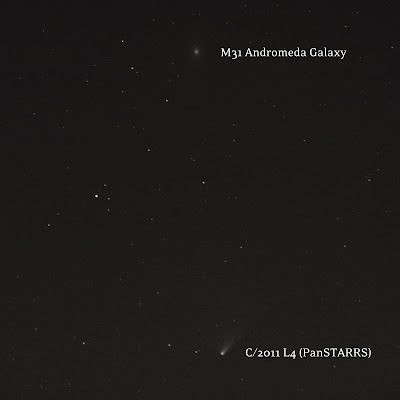 Once I knew I was in the area, I used the same technique from the last time I spotted Andromeda or PanSTARRS - and that is to take 10 second exposures and see what blobs appear. 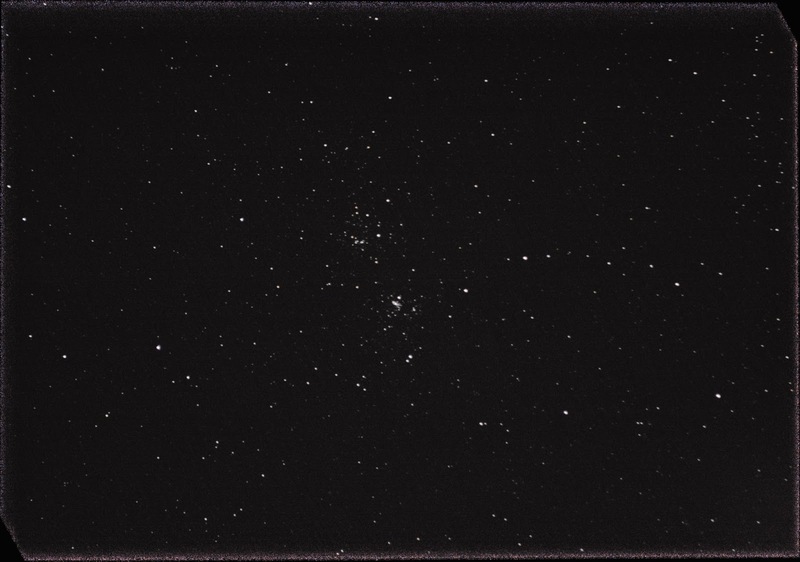 Then, once you have the images framed well, take exposures more appropriate for stacking (in my case, 1.6 sec at 190mm). 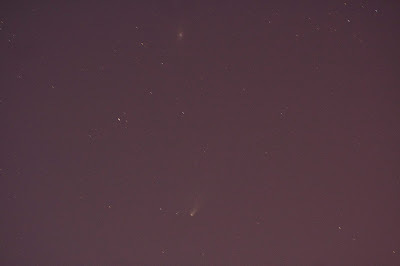 Here is a wide field shot to show just how low M31 ended up at the end of my night. 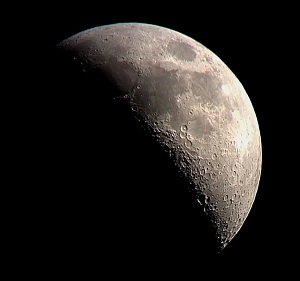 With all the atmospheric distortion and light pollution, it's a wonder I was able to see the darn thing! In February I stacked a series of 168 subs, 30 darks, and 30 bias frames to create my best attempt at the Orion Nebula (M42). Now, with Orion getting lower and lower in the sky, I wanted to try adding to the stack before the constellation dips below the horizon. 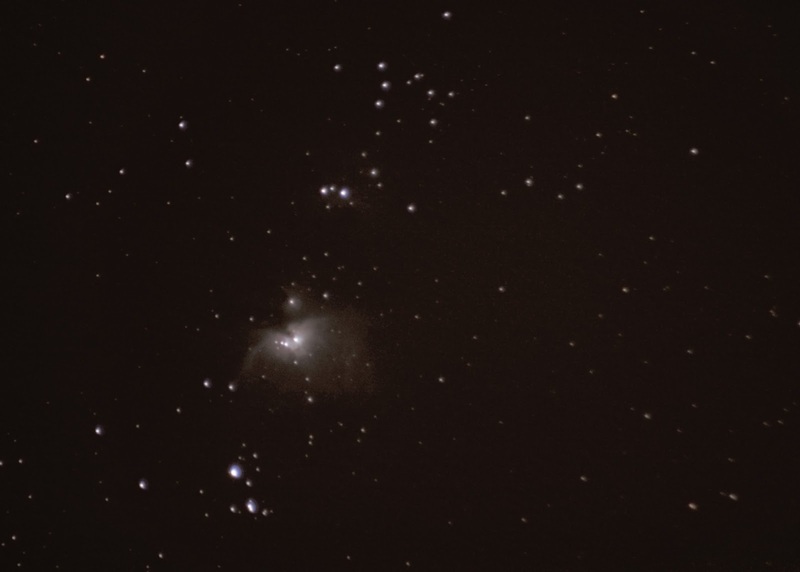 Unless I get an exceptionally clear night, this is probably going to be my last Orion attempt of the season. I added another 112 subs to my stack (no additional dark or bias frames) for a total of 280 subs. 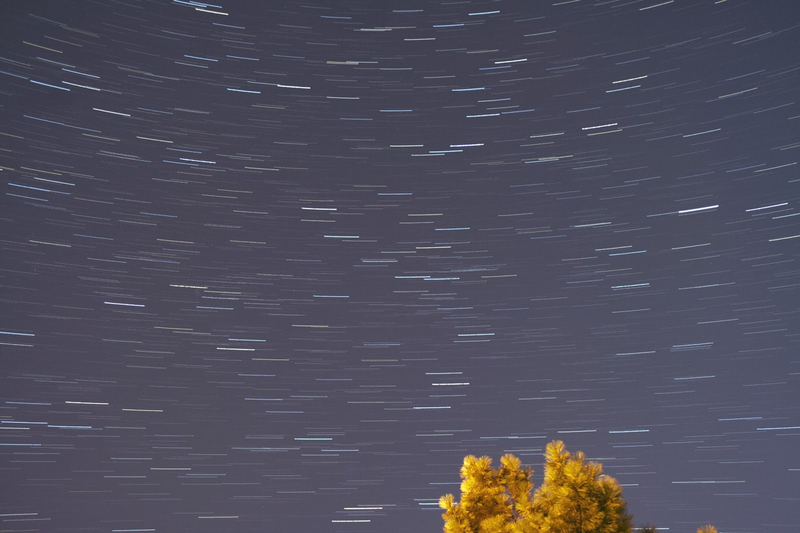 Because I noticed quite a few were trailing or out of focus, I kept only the best 70% for a total of 196 subs - which I believe is around 4 min 21 sec total exposure time. This new set was shot using the same ISO and magnification, but at 1.3 sec rather than 1.6 sec. 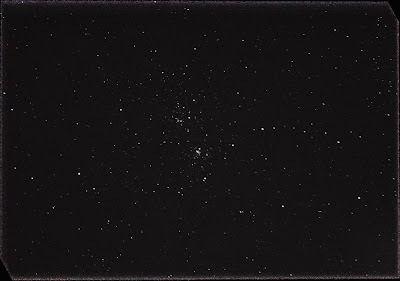 Deep Sky Stacker gave me a warning message, but handled the difference in exposure times remarkably well. This is a fairly quick pass at processing, I'm a little rusty since I almost never do deep sky stuff! Not much in the way of color, but the dust cloud is large and clearly visible. I also captured a whiff of the Running Man Nebula about 1/2 degree above the Orion Nebula. The running man is actually a combination of 3 objects (NGC 1973, NGC 1975 and NGC 1977) separated by some dark space in roughly the shape of a person. In my image you can only see a little blob of gray. 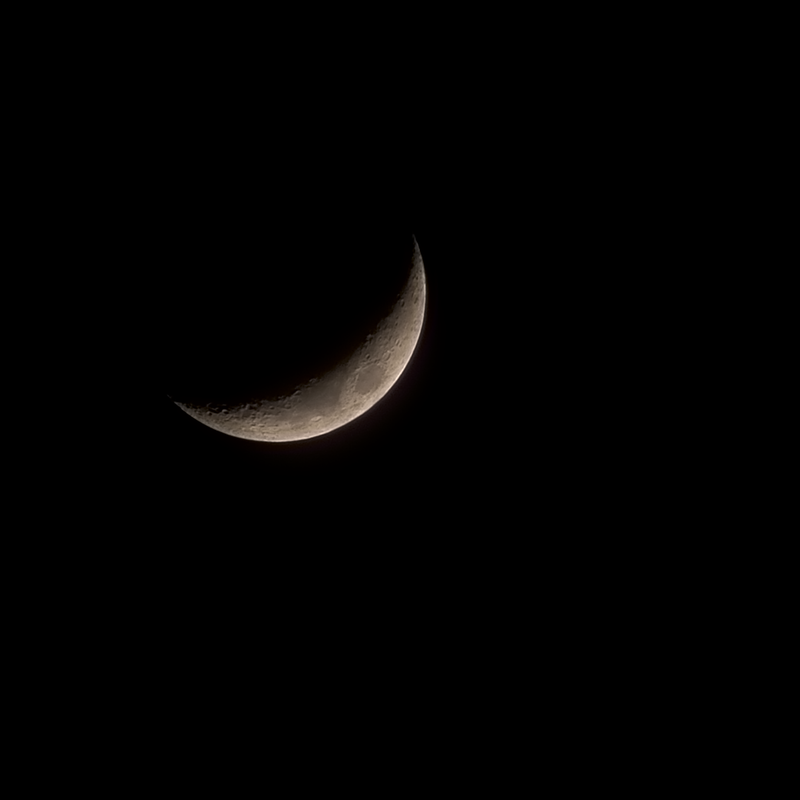 I grabbed this waning quarter moon between some clouds at 6:00am to round out my waning moon phase photos. 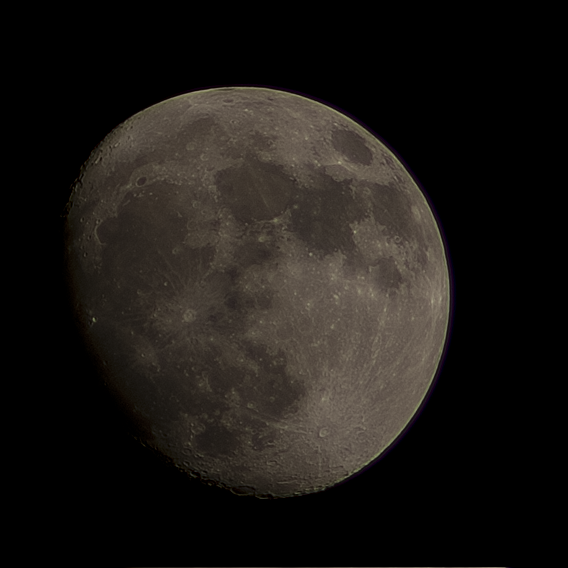 I'm not sure why I shot both my waning phases a little darker than my waxing phases. I kinda like the darker moon, it looks more like a stone and less like a spotlight. Since I made my waxing moon composite, I realized I was missing a lot of the waning phases in my moon collection. It probably has something to do with the fact that after the full moon, the moon rises later and later at night and into the early morning (at least recently). 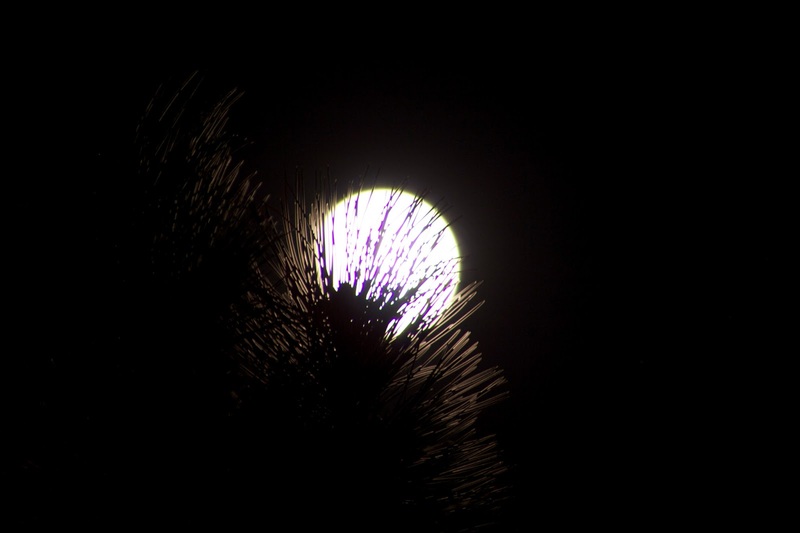 It could also be that the full moon is sort of the climax after watching the moon grow, and afterward it's less impressive to watch it slowly shrink. 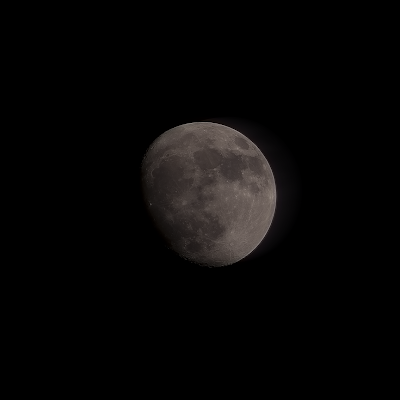 In any case, here is a 70% waning gibbous from 5:45 this morning!